Do Chickens Transmit Diseases to People? All animals, from crustaceans to humans, are hosts, both inside and out, to multitudes of bacteria and viruses. Kept in check they actually keep us healthy. Some bacteria even do essential body processes. 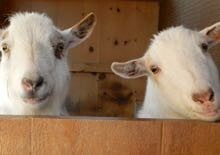 For example, goats need bacteria in their guts to digest grass. New research shows that even the so-called “bad bacteria” have important roles to play. It’s when things get out of balance that health issues occur. The chickens in our backyards carry around their share of germs and it’s prudent to worry about whether we can get sick from them. The quick answer is that there are very few diseases that humans and birds share. Our biologies are just too different. That said, there are a small number of pathogens to know about, all of which can be neutralized by hand washing and good animal husbandry. The truly scary diseases are not coming from the backyard flock, they’re coming from animal factories (let’s not call them “farms.”) I’m not going to go into a diatribe here about how crowded factory production facilities that rely on antibiotics to keep their animals alive are creating “superbugs” that are resistant to drugs, I’m sure you’ve read this on-going story in the press. Instead, let’s go over what you need to know about the hens in your backyard. The biggest fear that many have is of Bird Flu. The first cases of H5N2 appeared in North America in December of 2014. This is highly pathogenic to poultry, but at this point is not a concern to humans. Cases in the news of people getting sick are almost always in situations in which many dead and diseased birds are handled in close and unsanitary conditions. Even in those situations, the symptoms are mild. There are no cases of human to human transmission. However, our backyard flocks are in danger of contracting H5N2 – and it will decimate your flock. Wild waterfowl are the main vector and so it’s prudent to keep your chickens away from ponds and other areas that migratory birds congregate. Another disease that you might have heard is zoonotic (transmissible from animal to human) is Newcastle Disease. Rest assured that it isn’t of great concern for backyard chicken keepers. In chickens it causes respiratory ailments. Transmitted to humans it triggers mild conjunctivitis, but even this is usually only seen in people who administer the Newcastle vaccine to poultry, or are lab workers who do necropsies. Two other zoonotic diseases are erysipelas and chlamydiosis, which are mostly hosted by turkeys, and only affect humans who work in slaughterhouses, and farmers of large flocks. Avian tuberculosis is another one that is quite rare (it’s more prevalent with parrot fanciers) but possible to contract. Internal and external parasites are species specific and as nasty as lice and worms look, they’re not going to infect your gut if you somehow ingest them. The three bacterial pathogens that are of concern are Salmonella spp., Campylobacter spp., and E. coli. Generally, people get sickened by these bugs after eating improperly cooked and handled meat and eggs that have been contaminated with the germs, not by handling live and healthy chickens. Yes, poultry harbor these pathogens in their systems, but simply washing your hands after holding your hens is generally enough to prevent disease transmission. One exception that occurred recently involved chicks from large hatcheries. Children who kissed the chicks came down with salmonella. Other issues that might come up, but that aren’t transmissible diseases, are allergies, and respiratory irritations due to mold and dust. Some people are allergic to the dander that chickens are constantly making as they grow and shed feathers. 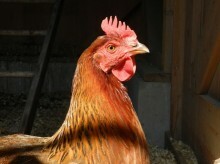 Chickens also create a fine dust out of bedding material and manure that they shred to bits as they scratch the ground. Sometimes bedding or feed will become moldy, especially if there’s been a long rainy period. Any respiratory and allergic reactions to these irritants can be minimized when one practices good manure management, and has a well-ventilated and dry coop. An article published by the Penn State College of Agricultural Sciences put it well. People should not fear close association with poultry as a significant human health risk. So, enjoy your hens. Handle them and spend time with them. Just don’t kiss them.